Mistake Fare Versus Sale Fare: Can You Tell The Difference? In the past year, I have taken three trips at exceptionally low fares. Can you guess which one was the mistake fare? Phoenix to Quito return, with an overnight stopover in Mexico City, for $398, in February. A lovely fall trip from Los Angeles to Copenhagen return for $545. Los Angeles to Beijing one-way via Europe (an inconvenient routing, requiring multiple stopovers and the airlines I used can’t get you there otherwise) for $450. If you’re scratching your head trying to figure it out, I don’t blame you. All of these were good fares, but they might have been either a good sale fare or a mistake fare. Only the last fare I listed, from Los Angeles to Beijing, is widely believed to have been a mistake fare. The airline didn’t include any fuel surcharges on the ticket. But it’d be an entirely normal price–or even a bit higher–for a direct flight between Los Angeles and Beijing. The low fare to Quito? An Aeromexico promotional fare to celebrate their newly launched service. And the Los Angeles to Copenhagen fare? A response by Air France to Norwegian Air Shuttle’s promotional fares, the latter having newly entered the market. 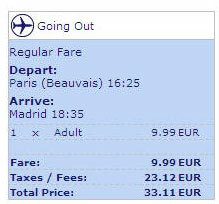 In Europe, Ryanair routinely sells flights for as little as one euro. There are $99 one-way flights from Baltimore to Iceland on sale as we speak. I recently flew on a $59 promotional fare from Los Angeles to Seattle, a route where flights often cost 3 times as much. So, if an airline sells tickets at a really low price, there is plenty of precedent: it’s usually a really good sale fare. This is particularly true on airlines such as Ryanair, who make most of their money on ancillary fees such as luggage charges and advanced seat selection. The fare is cheap because it only includes a seat. Nothing else. Seat assignments and luggage are extra. There is even a fee to buy the ticket! Yesterday, United Airlines was selling business class seats between London and Newark for about $75 roundtrip. Was this a competitive response to the far superior Club World London City service offered by British Airways? A promotional stunt? Or a mistake? United claims it was a mistake and they aren’t honoring the tickets. They have consistently argued with the US Department of Transportation that they shouldn’t have to honor fares they didn’t mean to sell, even after taking your money and issuing you a ticket. Up until now, the Department of Transportation hasn’t agreed. In pleadings before the Department of Transportation, airlines have argued that travel bloggers are Evil Incarnate, spreading news of mistake fares far and wide and costing them millions of dollars. When there is a mistake fare, they argue, airlines’ financial losses are greater these days because news of good deals just spreads faster. Well, this is definitely true. However, usually it’s not news of mistake fares. Instead, it’s free publicity for the airlines and I don’t think that they should get to pick and choose which kinds of deals bloggers can communicate, and which ones they have to honor. After all, I have personally helped to hand the airlines a megaphone when there are good sale fares they want advertised. For example, I drove tens of thousands of dollars in business to Alaska Airlines with this blog post. There is also a fairness issue. After all, if you want to get out of something in the airline’s Contract of Carriage, the airline doesn’t offer you any flexibility. So, why should they get to weasel out of the contract when it would benefit them? Nobody has filed a complaint with the Department of Transportation yet about United’s refusal to honor yesterday’s mistake fares, but it’ll be interesting to see whether they allow United to get out of the contract. I hope the government doesn’t hand airlines a license to gin up all the free publicity they want while not actually having to deliver the goods. Next Next post: Get Full Delta Credit For Miles Flown Plus 25K Europe Roundtrips!